'Hoodoo City' - In the morning we drove through the rest of Zion Park, including the mile long tunnel built in 1930. We arrived at Bryce Canyon Park in the early afternoon and found a campsite. We were glad to feel the cooler temperature of the high altitude. 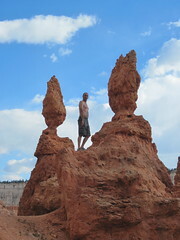 After a buffet lunch and a park introduction at the visitors center, we plunged into the canyon for a three mile hike. Strolling through the canyons and pinnacles was definitely worth the hike. Looking over a canyon has one kind of grandeur, looking up at the columns of red rock provide a different one. We drove to the several lookouts and then watched the sunset while strolling the rim. We ended the evening enjoying the Lodge and stumbling across an astronomer's bash enjoying the pre-moonrise in a remote high altitude setting. We enjoyed the cool night in our 'hardshell camper'.